A new behind-the-scenes documentary tracking the marathon trial of Ratko Mladic has upset some by depicting the genocide defendant as a human being, not a monster – but its director says it’s necessary to understand why people commit terrible crimes. “It is difficult for victims, and I understand that,” says Rob Miller, a film-maker who has just wrapped up his project documenting the trial of Ratko Mladic. The film, entitled ‘The Trial of Ratko Mladic’, tracks the defence team, the defendant’s family and his supporters as prominently as the prosecution, which has caused upset. Miller’s film, co-directed with Henry Singer, follows the extraordinary international-law effort to bring Mladic to justice over 530 trial days at the International Criminal Tribunal for the Former Yugoslavia in The Hague, which heard 592 witnesses and considered nearly 10,000 pieces of evidence. The task of making the documentary took eight years, during which time Miller got married, lost his father, and had a daughter who is now four. It began on the day Mladic was arrested in 2011, after nearly 16 years on the run, when Miller was 33 and making documentaries for the BBC. Previously a human rights worker, Miller foresaw that the capture of the so-called ‘Butcher of Bosnia’ in Lazarevo in Serbia would be a crucial litmus test for the still-developing field of international justice. So he picked up the phone and dialled the Hague Tribunal. “I’m from the BBC,” he remembers saying, “and I’d like to make a film about the Mladic trial.” Given the delicacy of the proceedings, it was a long shot. But the BBC was a trusted name – and Miller had luck on his side. “It coincided with a point in the tribunal when they thought what they were doing was really important, but that not many people knew what was happening inside that building,” he recalls. The tribunal wanted people to understand. Building trust with the UN court’s administration took months of correspondence. After that came the prosecution and defence teams, who were sceptical. But after a year of meetings, Miller and Singer had a tentative go-ahead to begin development. The remarkable film that emerged offers exclusive, long-term, behind-the-scenes access to both sides. On the one hand, it is a testament to the bravery of those who took the witness stand. The film-makers spoke to the first witness to be heard in the trial, Elvedin Pasic, who was 14 on the day in 1992 that his village was attacked by Bosnian Serb forces. “I’m a little bit nervous,” Pasic admits as he prepares to lay out his story in front of a room full of strangers at the Hague court. During his testimony, he broke down and sobbed for several minutes while recounting his father’s death in what he testified was a mass execution on the second floor of a school in the village of Grabovica. The prosecution team are meanwhile seen to struggle with their undertaking. “It got to me, and that’s not supposed to happen,” says prosecutor Peter McCloskey after watching one too many harrowing pieces of footage. But the film also features Mladic’s son Darko describing the Bosnian Serb military leader as a “very good person”. Branko Lukic, the lead defence lawyer, piles in to argue that the trial is pointless. “We should bury our dead,” he says, which may upset the thousands of people whose relatives were never found after mass graves were dug up and re-interred by Bosnian Serb forces to hide the evidence of their crimes. “Having wounds reopened all the time cannot help reconciliation,” Lukic adds. But Miller insists that, however upsetting, it is necessary. “To just dismiss someone as a monster is very convenient. Maybe it’s convenient for humanity that these people accused of terrible crimes are just anomalies. But, whether you find him innocent or guilty, you still have to try and understand people if you want to learn something,” he insists. 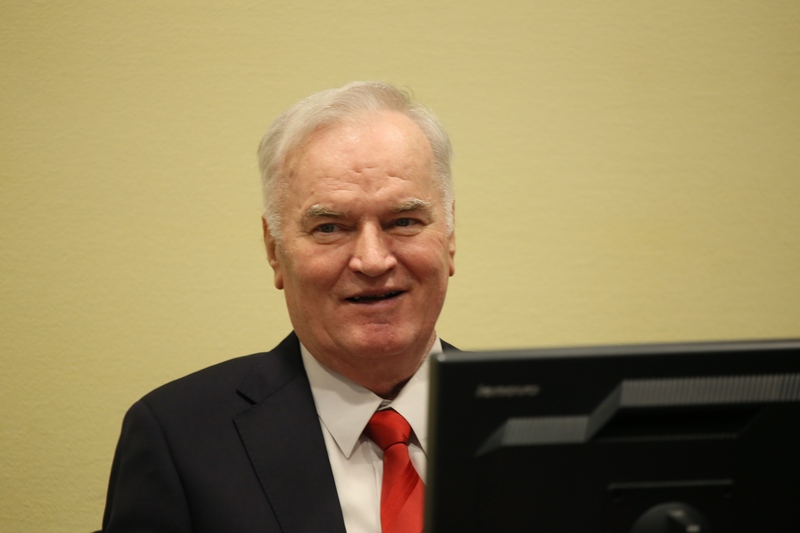 The viewer is left to judge Mladic, which was always the intention. But what Miller couldn’t have foreseen back in 2011 was the backsliding in human rights that would take place globally as populists such as Donald Trump rose to power and public will for any kind of foreign justice intervention waned. “I look at the world now, and no one gives a f*** about human rights – in terms of what’s going on in Syria, Myanmar, Sri Lanka. The era of impunity has returned,” he says. So the film is about Ratko Mladic. But it is also about the Hague Tribunal itself – that slow, cumbersome piece of justice machinery, accused of bias from all sides, which nonetheless brought convictions against major players in the Balkan conflicts. Miller can understand criticisms of the tribunal, he says. “But would I prefer to live in a world where, however imperfect, the ideals are championed and people who do bad things or are or alleged to have done bad things are prosecuted?” he asks. ‘The Trial of Ratko Mladic’ is screening at the Barbican in London on March 17 and 18 as part of the Human Rights Watch Film Festival. It will also be shown on PBS Frontline on March 19 and later by the BBC.